With the running of the 2015 New York City Marathon, tens of thousands of professional and amateur competitors (and their fans) from more than 100 countries will once again descend upon the five boroughs of the Big Apple. On display: Miles of motivational music, piles of paper cups and discarded warm-up clothes and endless amounts of inspiration. A true New York institution, the race has a rich history, accented by the fight for gender equality and the rise of charitable giving. Here are eight things you may not have known about the New York City Marathon. 1. The first winners won watches and recycled trophies. Like many great things, the New York City Marathon started out small. Only 55 men finished the first marathon in 1970. By contrast, more than 50,000 men and women crossed the finish line in 2014, and at least that many are expected to run this year’s race. The first-ever winners won inexpensive watches and recycled baseball and bowling trophies. The prize purse for the 2015 New York City Marathon is $705,000, with $100,000 awarded to first-place finishers, with potential bonuses of up to $50,000, depending on how fast they finish. But for context, the registration fee for the 1970 marathon was $1. Today, the fee is around $250 for Americans and about $350 for international entrants. The initial marathons were held entirely in Central Park, but the course was re-routed through the city’s streets in 1976 to celebrate the U.S. Bicentennial. The redesign was so successful, the marathon has been a five-borough race ever since. 2. In 1986, a Vietnam War veteran crossed the finish line after 98 hours — on his hands. The marathon is more than just a runner’s game. Since 2000, the New York City Marathon has featured separate Wheelchair and Hand Cycle divisions for athletes with disabilities. In 2014, 244 athletes with various disabilities, as well as 200 volunteer assistants, participated in the race. Surrounded by cheering supporters, Bob Weiland throws his fists in the air after crossing the finish line at the LA Marathon in 2003. L.A. Photo by Richard Hartog/Los Angeles Times via Getty Images. 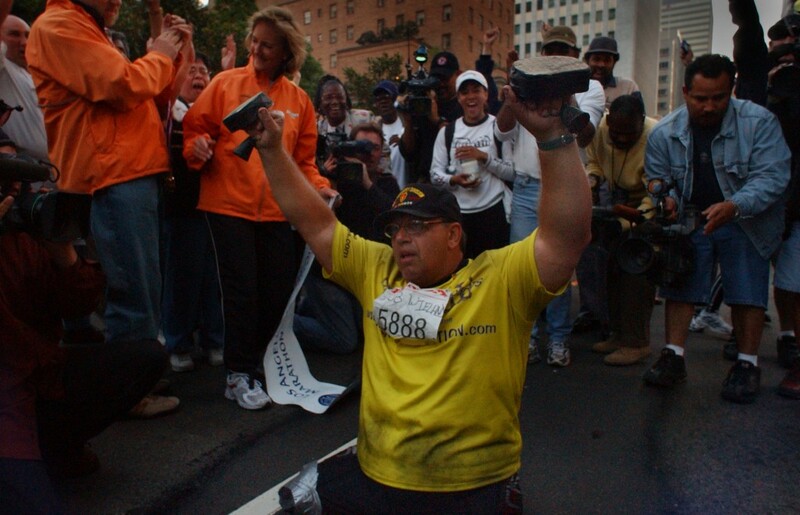 During the 1986 marathon, Bob Weiland, a Vietnam War veteran who lost his legs in battle 17 years earlier, crossed the finish line after about 98 hours — on his hands. Weiland covered the course using only his arms to propel him, stopping to talk with vets, the homeless and others who inspired his endeavor along the way. “I finished ahead of 300 million Americans who never finished the race,” Weiland told The New York Times in 2011. He’s competed in handfuls of other marathons, too, and he’s also the only double amputee to finish the Kona, Hawaii, Ironman race without a wheelchair. 3. Brooklyn is the fastest borough. It’s not called a marathon for nothing. Over bridges, along the water, through parks and across the pavement, running 26.2 miles through a city as diverse as New York can be a tiring tour for your feet. 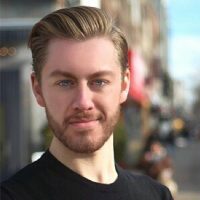 According to marathon statistics, the fastest borough for runners is Brooklyn, due to its mostly flat terrain resulting in an average speed of 8:14 per mile. That could also be thanks to the Bishop Loughlin High School band that has played every year for the past 35 years around mile nine in Brooklyn. Dubbed “the original Marathon band,” the high schoolers play the theme song from Rocky over and over again until every runner has gone by. 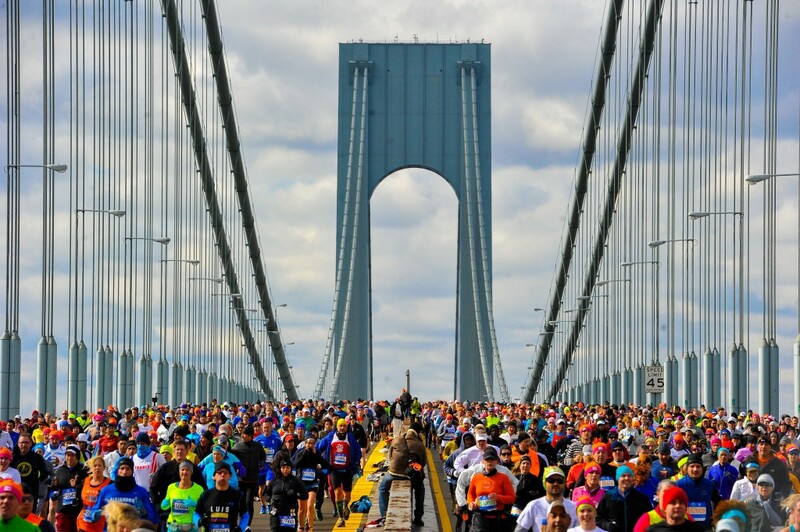 Runners cross the Verrazano-Narrows Bridge at the start of the TCS New York City Marathon on November 2, 2014 in the Brooklyn borough of New York City. Photo by Alex Goodlett/Getty Images. But around mile 15, the Queensboro Bridge is considered one of the toughest points in the course, and with no spectators allowed on the bridge, it’s also the quietest. After crossing the Pulaski Bridge, the halfway point of the marathon, average pace slows down to 9:14. 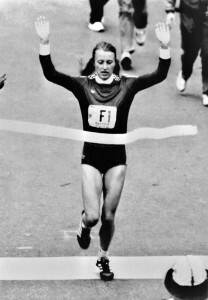 Grete Waitz of Norway crosses the finish line of the 1980 New York city Marathon, on October 26, 1980. Photo by AFP/GettyImages. 4. Women weren’t allowed to participate until 1971. In the early years of the marathon, women were barred from running because the Amateur Athletic Union, the then-governing body of track and field and distance running, which sanctioned events like marathons, deemed it too dangerous for females to run such great distances. The ban was lifted in 1971, but only allowed women to participate if they started the race 10 minutes before or after the men. Then, at the 1972 marathon, women made history without taking a single step. The six women who entered the race that year lined up at the starting line and the gun went off to signal their head start. And the women sat down. They remained seated, holding up signs mocking the AAU’s discriminatory policy, until it was time to for the rest of the entrants to start. Since then the participation rate for women has steadily climbed to about 40 percent. 5. The marathon raises millions of dollars for charity each year. 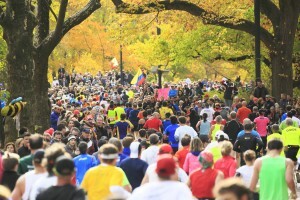 Thousands of NYC marathon runners raise money for charities every year. The first official charity of the race was Fred’s Team, established by the father of Fred Lebow, the founder of the marathon who died from brain cancer in 1994, two years after he crossed the finish line at the race. In 2014, 8,500 charity runners raised a record $34.5 million for hundreds of charity organizations. 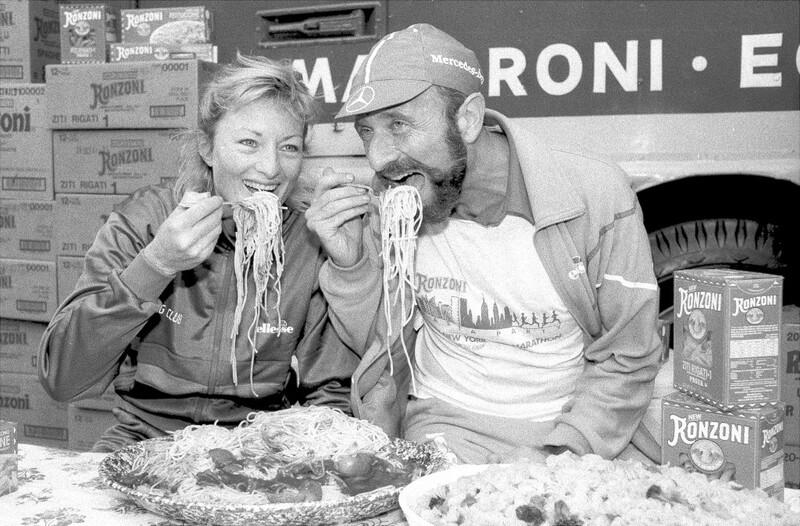 Allison Roe and Fred Lebow of the Roadrunners Club carbo load before the 1982 marathon. Photo by Dan Cronin/NY Daily News Archive via Getty Images. But plenty of runners go above and beyond raising money by literally donating the clothes off their back. On race day, many runners show up to the starting line in the early morning hours, bundled up for November temperatures, only to shed their layers in the first few miles of the race. Approximately 26 tons of clothing are discarded every year, which are collected by volunteers and donated to Goodwill. 6. At least one couple has gotten married during the marathon — and still finished. Whether to win, to finish or to raise money, everyone venturing through the 26.2-mile racecourse at this year’s New York City Marathon has made some sort of commitment. But in 1993, two runners made quite another. That year, Tom Young, 32, and Pam Kezios, 31, a couple from Chicago, stopped at Mile 8 on the steps of the Brooklyn Academy of Music to tie the knot. Young donned a top hat and tuxedo, while Kezios wore a veil and white dress at the small ceremony. After exchanging vows, they continued with the race. Talk about an adrenaline boost. 7. The event has been marred by cheating scandals in the past. Yes, like all competitions, the New York City Marathon isn’t immune from scandal. In 1979, Cuban-born New Yorker Rosie Ruiz became the most notorious marathoner for faking her finish. She was reportedly spotted leaving the course after only 10 miles and then took the subway to the finish line. Five months later, she was stripped of her marathon medals for New York City and Boston, where she was also accused of cheating. Maybe Ruiz should have claimed to have gotten lost — which is possible. 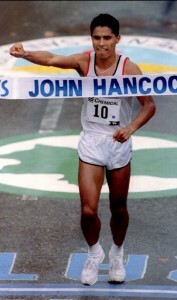 In 1994, Mexican runner German Silva was in the lead but made a wrong turn near Central Park during the final mile. After 12 strides in the wrong direction, he realized the mistake and chased down a runner who had passed him. Even with the lapse in direction, Silva still won with a time of 2:11:21. 8. Millions of paper cups are used during the race. The 26.2-mile course is equipped with 62,370 gallons of Poland Spring water and 32,040 gallons of Gatorade, which are handed out in recyclable cups at official fluid stations every mile. That accounts for the more than 2.3 million paper cups that need to be picked up along the course after they’ve been tossed aside by runners. 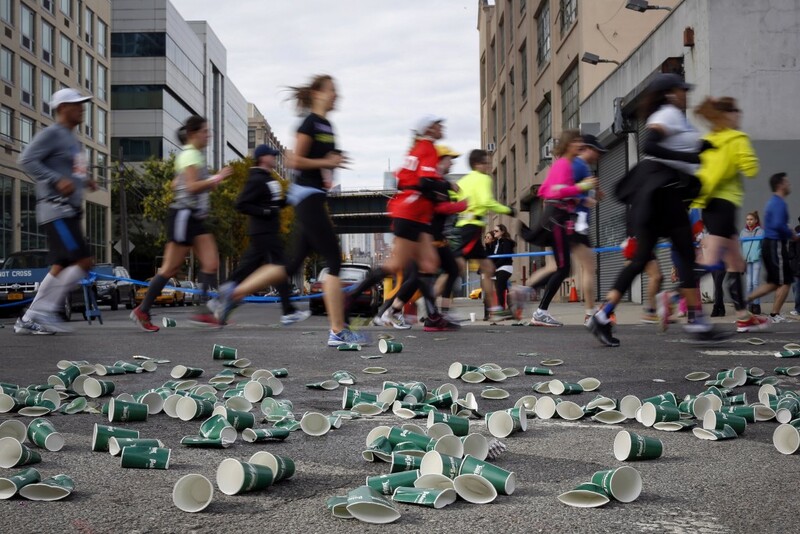 Discarded cups are seen along the route as runners make their way through the borough of Queens during the New York City Marathon on November 3, 2013. Photo by Shannon Stapleton/Reuters. But for some athletes, thirst quenchers are best served by the pint, which is why plenty of bars along the route offer drink specials for runners and spectators in celebration of the marathon. (Some runners even like to imbibe during the race.) Talk about carbo-loading.